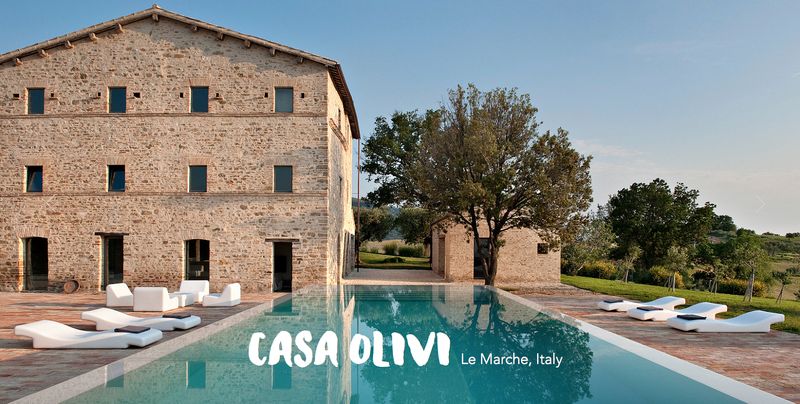 Casa Olivi is located in Treia, in the heart of the Marches, The New Tuscany. Its renovation took 4 years, conducted by the 2 swiss architects Markus Wespi and Jerome de Meuron. The outside style has been preserved as the building is protected by the Italian Cultural and History Administration, but the inside has been entirely re-organised according to a luxurious, high comfortable and minimalist style. The house offers 11 sleeps in 5 bedrooms, 4 in the house and 1 in the independent guest house. All bedrooms are en-suite with own bathroom and air conditioning. Ground floor: double living with fireplace and TV, home theatre Loewe, professional dream kitchen in inox ArcLinea, dining room for 12 people, laundry room with washing machine and dryer, toilets, fitness room with runner and kinesis wall Technogym. First floor: big entrance, 1 bedroom with 3 simple beds, closet and bathroom (shower), 1 bedroom with 2 simple beds, closet and bathroom (shower) Second floor: 1 bedroom with king-size bed, closet and bathroom (shower), 1 bedroom with king-size bed, closet and bathroom (bath tube and shower), big office and closets. Guest house: 1 bedroom with queen-size bed, closet and bathroom (shower), living room with panoramic views on the landscape until Monte Conero. The Villa presents design furniture from italian, spanish and french designers (Vitra, Cassina, Gandia Blasco, Philippe Stark...), as well as furniture designed by wespi de meuron. On the south part of the house, a big terrace in terracota with pergola, dining table for 12 people, outside inox kitchen with grill and teppanyaki (Japanese grill), amazing infinity pool 5x12m. The house is in a panoramic position with a 360 degrees view on the landscape, 1 hectare of land with olive trees. 5 minutes from the city of Treia with a very good asphalt road, 20 minutes from Macerata and its open air opera festival in the summer, and 1 hour from Ancona airport, Casa Olivi offers an ideal position to visit The Marches, enjoy the adriatic coast as well as some beautiful cities in Umbria.